Hearty Pumpkin Chili is a delicious, vegetarian dish made in the slow cooker! My family didn’t even miss the meat in this one! So my husband and I have this deal that whoever cooks dinner, the other person does the dishes. We’ve been doing this for years. Obviously the kids pitch in too with the dishes, but I’m a little particular about making sure my pots and pans are scrubbed well, so usually the adult does that part. It’s no secret that I’m a little bit of a cheater. On the days I know it’s his turn to cook, I try to encourage an “easy cleanup” kind of recipe. Oh yeah, grilled cheese and tomato soup sounds amazing, dear. Tacos is a great choice, honey! Or, yep, I’d love cereal for dinner, haha! But the days I cook? I’ll occasionally go all out for a really nice meal, with homemade bread, and a salad, and don’t forget the fried cinnamon chips to go with the carnitas…you get my drift. And if that isn’t bad enough, I’ll also make a Pumpkin Cheesecake Cake for dessert (and put those dishes in the sink too). Whoops. Speaking of pumpkin, I always save the little bit from the can when a recipe only calls for a cup or so. I use the leftover in Pumpkin Smoothies (so good!). A few weeks ago I was making a vegetarian chili and thought, why not add the leftover pumpkin to the dish. Truth be told, my husband hates pumpkin, so I added enough to make the chili thicker, but not enough to give it a pumpkin flavor. I love adding veggies in a sneaky way to get those extra vitamins in everyone. And if you’re wondering about those dishes for my hubby, no worries. This night it was an easy cleanup for him. Everything got tossed into my favorite crockpot (it’s so easy to clean) and he only had one thing to clean. It’s a win-win for all of us! 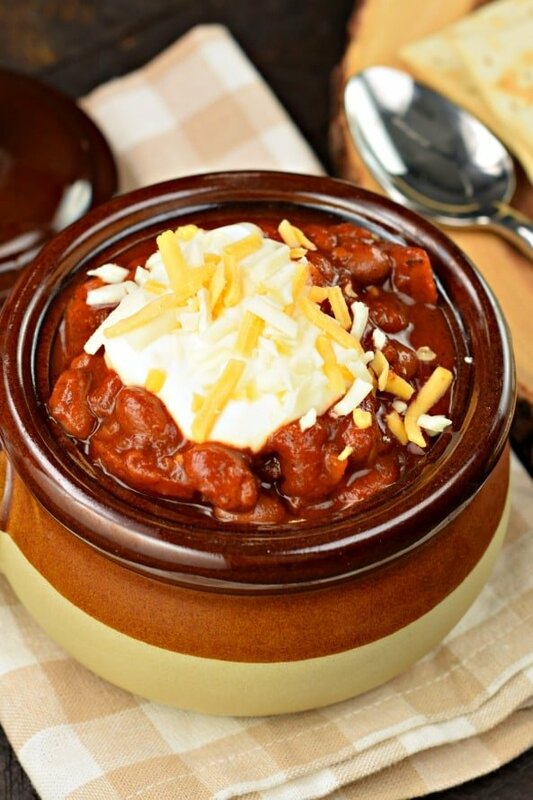 Hearty Pumpkin Chili is a delicious, vegetarian dish made in the slow cooker! My family didn't even miss the meat in this one! Add everything to your slow cooker. Stir, then cover and turn on low for 6 hours. Before serving, use a fork to break apart the tomatoes if needed. Usually, they will have already done so on their own, but just in case your family doesn't like big chunks you can break them up more! 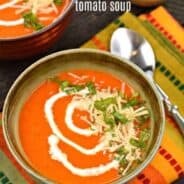 When ready to serve, enjoy with sour cream (or greek yogurt), shredded cheese, and diced onions. ENJOY! Craving more vegetarian dinners? I’ve got you covered! These Vegetarian Zucchini Meatballs are seriously so good. Put them on pasta, or in a sub sandwich and you’ll thank me later! How does dinner in under 30 minutes sound? This One Pot Vegetarian Spaghetti recipe from Family Food on the Table not only sounds delicious, but it’s quick and easy too! I could tex mex all week long. Roasted Veggie and Black Bean Burritos from Aggie’s Kitchen are the best. 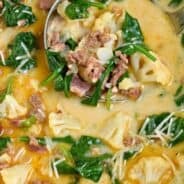 My family LOVES this recipe, and they don’t even mind it’s vegetarian! 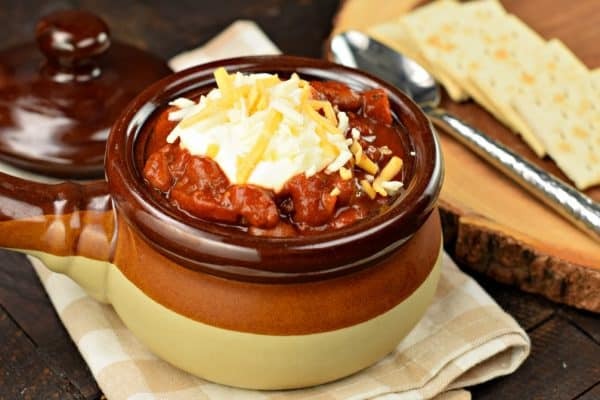 Add some smoky flavor to your chili with this delicious Smoky Sweet Potato Chili recipe! It goes on our dinner rotation at least once a month because it’s so tasty! A delicious vegetarian dish ! This chili looks amazing!! Love the pumpkin for fall. Love the pumpkin for fall. This sounds SO hearty and delicious!! Perfect for fall!! What a fun fall twist! 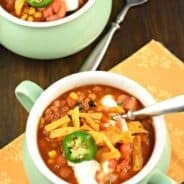 Love this pumpkin chili! So good on a cold night! Oh man, this is so great! 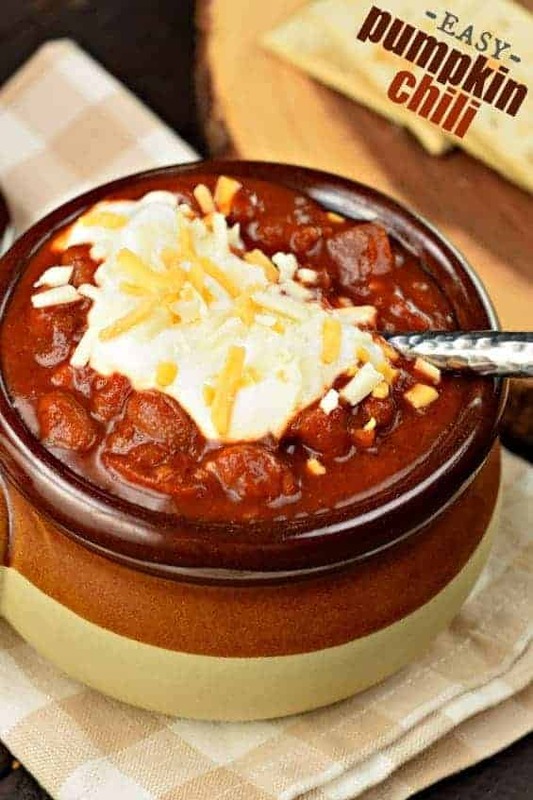 Chili is our favorite Halloween dinner! 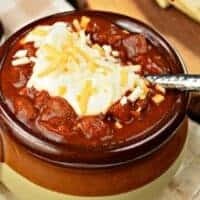 I love the way pumpkin goes so well with chili flavors. This is fab!